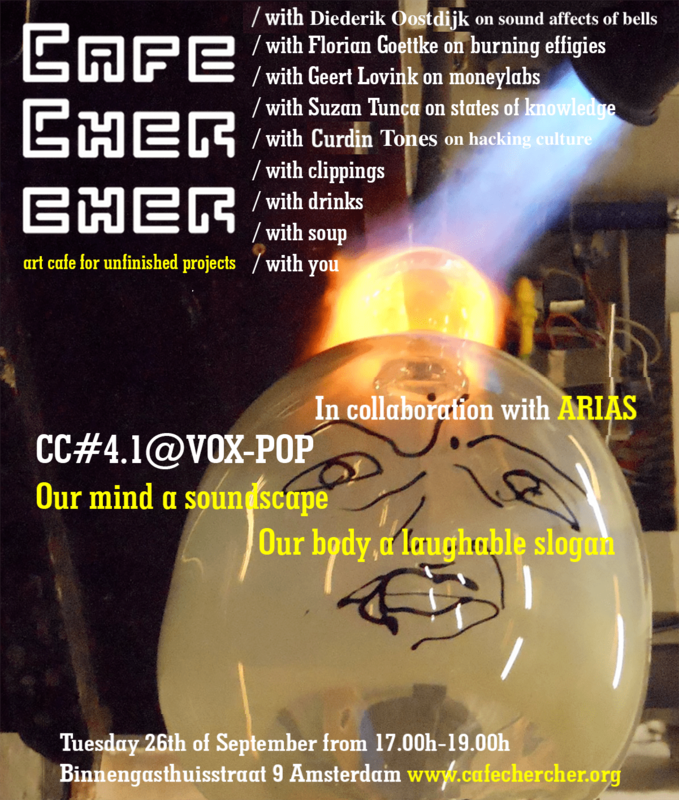 We warmly invite you to the opening of Café Chercher season #4.0! We are happy to announce that this special edition is organized in collaboration with ARIAS (Amsterdam Research Institute of the Arts and Sciences). Together we will toast on a new year of unfinished art research. Join us for an evening with projects from different disciplines and research institutes in Amsterdam. / with Florian Goethe on image practices in public discourses: can we use images as arguments? / with Geert Lovink on moneylabs: how are artists going to make a living in the 21st century? Clipping #4.1 Doubts and questions (by Emily Huurdeman) from Café Chercher Amsterdam on Vimeo. Sign up for our monthly newsletter to keep updated, or follow our Facebook page and Facebook event page! The entrance at Café Chercher is still free and there are sponsored drinks thanks to ARIAS. There is soup thanks to the Rietveld Research Group. We are happy to be hosted for a fourth season by VOX-POP UvA Creative Space and we are supported by MA Artistic Research UvA.